The fascination of wearable illumination just got another twist by illumination fashion designer Moritz Waldemeyer who created a pair of illuminated sneakers for ‘Step Up 3D’, for the world’s first dance movie in 3D. Over the past years we have seen shoes and sneakers upgraded with illumination ranging from kids shoes with blinking light in the sole to more stylish looking party sneakers using LED or EL elements. Moritz has like in his other illumination clothing designs, raised the bar of how light elements in shoes can spice up otherwise dull and static looking shoes. 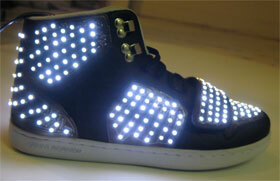 LED panels are placed around the sneakers. Integrated motion sensors create waves of light across the shoes depending on the movements of the dancers. ‘Step Up 3D’ will be released on August 3rd where the LED Sneakers will be at the spot light of action. I don’t think this type of shoes will make it any time soon to retail, they might be too fragile to be beaten up on our city streets but for partying – LED sneakers would serve as a cool outfit.